WORLD MUSIC MONTH AT THE QUARTER! Zdenek & Christie are the core duo of producer/arranger, bass player, composer Zdenek Kansky, and his wife vocalist, pianist, producer and composer Christie Kanska. 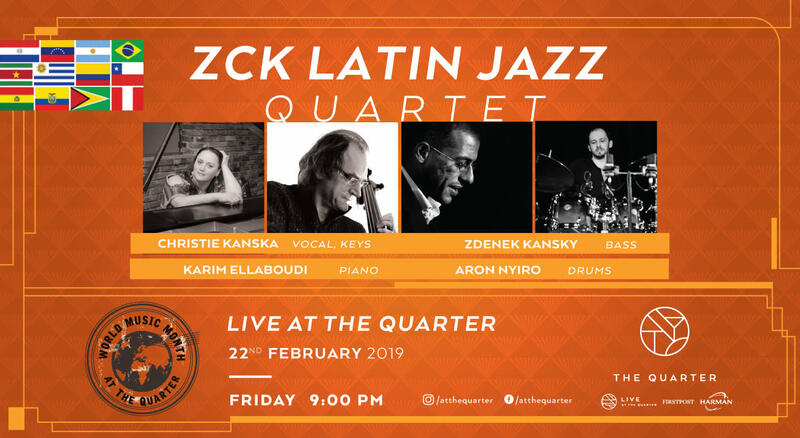 Together with a host of musicians and guests, they offer a modern concoction of Jazz, Latin, Fusion, World music, Funk and off-kilter broken beats, shifting, twisting rhythms, and adventurous electronic explorations. Christie Kanska is happy to announce the release of her latest studio album called Le Rêve -The Dream. As the producer of this album she wanted to create a fresh sound of Latin Jazz with a fusion and mixed style feel to capture the positive spirit and story behind each song. Le Rêve - The Dream features 11 tracks. Track- the “Le Rêve”, is an original instrumental composition by Christie Kanska. The other songs are 7 well-known bossa nova standards by some of the best known Brazilian singer-songwriters. They include Bananeira by Joao Donato and the classic songs by Carlos Jobim which include: Dindi, Triste, Fotografia , No More Blues, One Note Samba and the iconic Girl From Ipanema. All tunes were arranged by Zdenek. The compilation and arrangements of these songs provided creative and challenging opportunities for Christie as the vocalist, pianist and producer to find new approaches to create unique musical expressions. Brazilian music, particularly bossa novas, is Christie’s favorite style; when she performs the samba she feels completely relaxed and like a “fish in water.” The album also includes a swing song by Cole Porter: “From this moment on” in a Brazilian baiao rhythm. This album also includes an upright bass inspired composition by her husband , co producer and arranger Zdenek Kansky from which the Latin jazz theme for the album originated. “For Christie” by Zdenek Kansky is an enchanting melody highlighting some of the that wonderful contemporary jazz music, filled with so much space and infinity that it makes you embrace the unembraceable. It is magical with the dreamy sound of string pads with smooth chord progressions and open voicings. “Le Reve” offers that modern modal concept integrating electric and acoustic sounds. It is a mix of modern rock-fusion style with the smooth classic Bossa Nova sounds to convey the power and speed of our busy lives juxtaposed with the nostalgia and softness of more lay back times. **We are serving specially curated Pisco Sour/Caiprinha for the night!